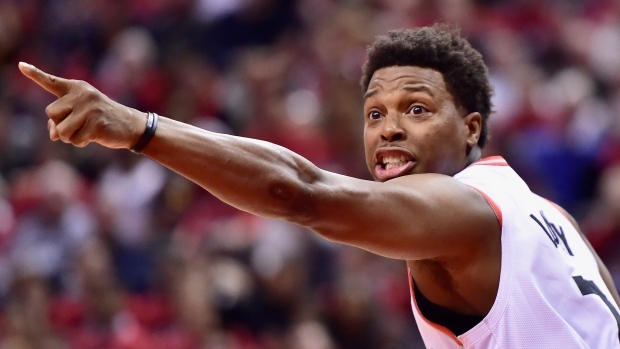 TORONTO — The Scotiabank Arena crowd let out a collective groan when Kyle Lowry's two free throws bluntly bounced off the rim in the third quarter Saturday night. It was Lowry's night summed up in two off-target shots. The five-time all-star point guard went on to score zero points, missing on several wide-open shots, and the Toronto Raptors dropped Game 1 of their playoff opener 104-101 to Orlando. Lowry's performance was like a song on repeat, a cruel joke for a player who's historically horrible in Game 1s. He's scored 33 points in series openers the past five years _ combined. But if history has proved anything, he usually bounces back with solid games. And as backup guard Fred VanVleet pointed out, Lowry contributes in numerous ways when he's not scoring. "We've seen him dominate games while scoring only 10 points," VanVleet said. "You know how it goes. He's not a player whose points define how impactful he was on the game. Obviously, nobody wants to go 0-for-7 in a playoff game. "(But) as long as he's still leading, talking, taking charges, yelling at the refs and scratching and fighting then he's doing his job. He'll make shots. He's proven it. We've got Game 1 out of the way, so I'm looking forward to seeing how he turns out Tuesday." Lowry's game was reminiscent of his 3-for-13 performance in Game 1 against Miami three years ago. After that loss, Lowry famously stayed on the court, hoody pulled up over his head, shooting until well after midnight. He bounced back to lead Toronto past Miami and into the Eastern Conference final in the Raptors' best playoff performance in history. Lowry has shot 40 per cent in Game 2s. Lowry didn't speak to the media Sunday, simply because the team has a rotating list of players made available to the media each day. Coach Nick Nurse stuck up for his guard. "I just think he was leading the team pretty well," Nurse said. "He had us fighting and battling pretty well. I thought we were getting pretty good looks. He was getting us into sets that were providing those looks. He was making his defensive plays. He got a charge, he had a nice little strip on another double team. He was fighting like hell keeping guys off the boards. So there were a lot of positives as far as his play. "So what do you say? I say to him you are going to have to take these shots. They are rhythm _ of the six threes, five of them were wide open. Those are shots he's going to have to take and he's going to continue to take them." Orlando head coach Steve Clifford also felt Lowry played a solid game overall. "People are saying stuff about Kyle," he said. "He (had) eight assists, two turnovers, he missed some shots he won't miss next time and they were (plus-11) when he was on the floor. "So if you watch the film, the guy played a terrific game and he missed a couple of shots." Orlando guard D.J. Augustin, meanwhile, scored 25 points including the three-point dagger with four seconds left to lift the Magic to victory. Augustin played a few weeks with Toronto in 2013 before the team waived him. Asked if facing a former team planted a chip on his shoulder, the guard said: "It's been six, seven years since I played here. I think it's just a chip on all of our shoulders, people not expecting us to be where we are today. We play hard man every night." How many times had he watched video of his winning bucket? "I've seen it a lot man, everybody's been sending it to me, tagging me in it. The funniest thing is probably I saw a little tag with me holding Kyle like a baby," he laughed. "A lot of people don't know me and Kyle are good friends, it's all competition. I think it's just funny man." Nurse and his players pointed out that despite a horrible game, it was still the Raptors' to win. Marc Gasol's three-point attempt on Toronto's second-last possession, for example, went in and out. "Hopefully the in and outs go out and in, and maybe some of theirs go out," Nurse said. "They doubled us in free throws. They made 18 to our nine. That's a bad stat to win the game. And they made more threes than we did. That's another bad stat to win a game in this day and age. If you're (not) gonna make more free throws and more threes, you're gonna have to battle." While Orlando is the No. 7 seed, the team arrived in Toronto as one of the hottest in the league down the stretch, matching the Raptors' conference-best 22-9 record over the past 31 games. The difference is the Raptors locked up their playoff spot weeks ago while the Magic had to scratch and claw over weeks of virtual must-win games. Did all that instill a greater sense of urgency in Orlando? "Maybe," VanVleet said. "They have been in do or die mode for a while, and that brings a certain type of urgency to the details of what you're trying to bring each day and they were pretty locked into what they were doing . . .
"(But) if we win and they lose then I don't know if that changes the narrative a little bit. Maybe we were super locked in if we win that game right? You never know. I think that we didn't do a good enough job to win and they did and that's just the reality of the situation and we've been here before unfortunately. . . move forward and try to get another win." The Raptors find themselves in a familiar position when they host Orlando in Game 2 on Tuesday _ having to dig out of a proverbial hole. Only seven per cent of teams that have gone down 0-2 have fought back to win playoff series. The series then shifts to Orlando for Game 3 on Friday and Game 4 next Sunday.